Thank you for your interest in R/O CONN reverse osmosis connector systems. Here are some reasons to use our patented units. 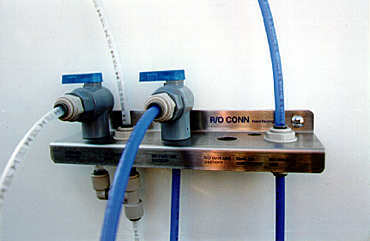 Simplifies hook up and disconnection of residential and light commercial reverse osmosis systems from 1/4 to 3/8 inch. Is expandable to include icemaker bypass valve, and the storage tank shut off valve. Provides greater flexibility and serviceability to installers when locating the reverse osmosis system and its components in areas other than under the sink. You will be able to hookup and remove hard to reach reverse osmosis systems with one hand and no tools. For more information or technical assistance please contact R/O CONN at (602) 432-5402, toll-free (800) 617-1474 or fax (602) 331-1122. Or you can E-mail us at roinfo@roconn.com . We look forward to hearing from you.